As we prepare for the end of the year, we want to make sure that our donors understand all of the possible payment options. For payments over $250, Federation will send you a tax acknowledgement by January 31, 2015. Payments made by check are considered received by the postmark date. 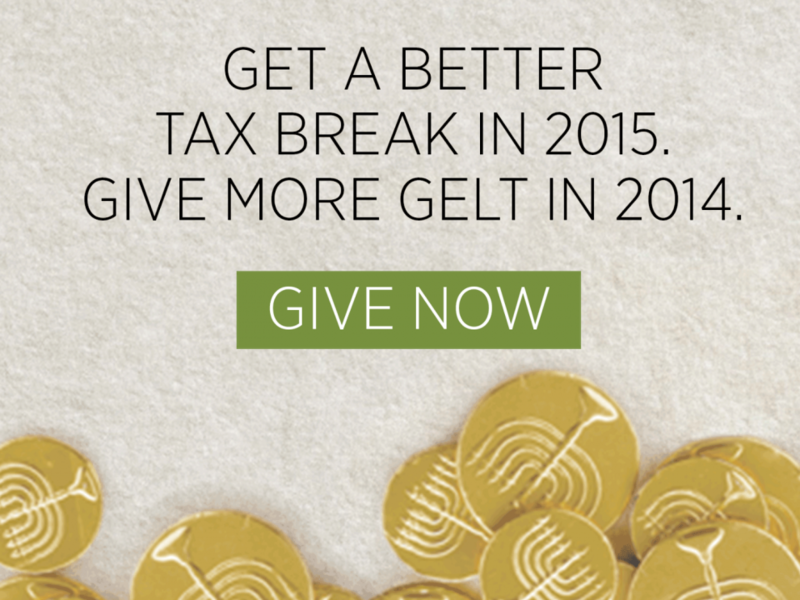 Checks postmarked and mailed by December 31 are tax deductible contributions for 2014. If the check is delivered in person, the gift is considered received when given to a Federation staff member. The Federation office will close at 5 p.m. on Wednesday, December 31. Please make checks payable to JFGP. IRS regulations state that credit card payments are considered received on the date shown on your credit card statement. Therefore, we encourage that all credit card payments be initiated by Tuesday, December 30. To pay by credit card, please go to www.jewishportland.org/donate. Questions? Contact Ben Winkleblack at 503-892-7417. Stock transactions are considered complete on the date the stock is received into Federation’s brokerage account. Stock transactions can take up to 5-7 business days from the initiation of the transfer. Therefore, we recommend you transfer stock by Monday, December 22. To donate stock, please call Ben Winkleblack at 503-892-7417. Learn more about the benefits of transferring appreciated stock. The IRA Charitable Rollover allows individuals over age 70½ to directly transfer up to $100,000 per year from an IRA account to one or more charities. This transfer counted toward the minimum required distribution rule for IRA accounts, and such distributions are free of both income and estate taxes. You can use your Donor Advised Fund to make a payment to Federation and many other organizations. For more information about your Donor Advised Fund or to set up a fund, please call the Oregon Jewish Community Foundation at 503-248-9328. For more information or clarification on any of these payment methods, please call 503-245-6219 or email info@jewishportland.org. Thank you for making the good we do possible!